Introducing the EVGA GeForce GTX 570 HD 2560MB. Enjoy blistering fast DirectX 11 performance, including tessellation performance that destroys the competition. Experience a whole new level of interactive gaming with SLI and combine up to three displays for the ultimate in 3D entertainment. 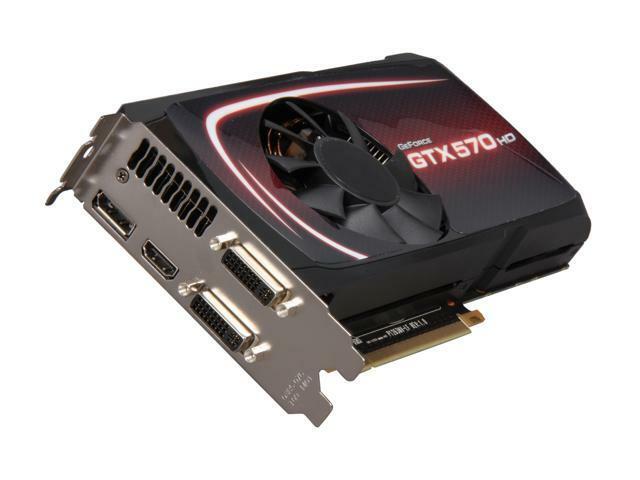 And as you have come to expect from the GeForce GTX GPU, the GTX 570 packs support for all the premium GTX gaming technologies such as NVIDIA Surround, 3D Vision, PhysX and SLI. With these features and more, the EVGA GeForce GTX 570 gives you more than one way to elevate your experience. NVIDIA PhysX technology NVIDIA PhysX technology enables a totally new class of physical gaming interaction for a more dynamic and realistic experience. NVIDIA 3D VISION, 3D Vision Surround NVIDIA 3D Vision brings a fully immersive stereoscopic 3D experience to the PC. Expand your games across three displays in full stereoscopic 3D for the ultimate “inside the game” experience with the power of NVIDIA 3D Vision and SLI technologies. NVIDIA Surround also supports triple screen gaming with non-stereo displays. Pros: I put this card through hell for 4 years, it withstood everything . Ultra settings on all. Lifetime Warranty if registered in 30 days of purchase. Thank you EVGA for providing this one time exception to me so I can have this card replaced. EVGA is standing behind the product and making sure they are keeping their customers happy. Cons: Card would randomly reboot system to a black screen. Other Thoughts: Everyone make sure to register your products! I would like to thank you for your feedback in regards to the EVGA GTX 570 graphics card. I am glad to hear that we were able to resolve the issues you were experiencing with your EVGA product. Should you or any potential EVGA customer ever have any questions or concerns with this or any EVGA product, then I would encourage you to contact our 24 hour Technical Support team by phone 1.888.881.3842 and pressing option 1 or by email: Newegg@EVGA.com so that we can assist you. Pros: Worked great for about a year and a half. Great software from EVGA. Cons: Started giving me issues after 19months. No overclocking. Well within normal heat tolerances. Clean driver installs(even a clean OS install). This card has never been 'abused', just normal wear and tear. Has been crashing computer semi randomly for the last 9-10 months now. Other Thoughts: I've spent the last 9-10 months trying to fix this issue. In this time I've confirmed that the card is most def the issue. This is way too soon for a card to start crapping out. The lifetime warranty is only valid if you register it within a short time after purchase. The card itself was good, until it wasn't. If you want to get this card, make sure to fill out the warranty card. I'm not alone in this. I've done many searches over the span of almost a year trying to fix this. It's severely tarnished my trust in this company, and will def impact future EVGA purchases. Other Thoughts: Why would this get discontinued? I got my first one and decided to wait awhile to SLI but apparently i waited too long. This was a very good card with excellent reviews, makes me sad to see it discontinued. Pros: This EVGA card is the best one I have ever owned before; this thing is a complete monster! I can play anything with this high-clocked card, and there is hardly any lagging in any game on my PC. The whopping 2.5GB of GDDR5 RAM just dominates my system. It also has HDMI so I can use this for my HD computer screen. This card by EVGA is HIGHLY RECOMMENDED! This was totally worth the price! Other Thoughts: This card is pretty large, so make sure you have enough room in your computer case. Some cases can cause this card to obstruct the hard drives or their cables. This is not really a con, but I have this minor problem with my case. Normally, I just move the hard drives into other slots and the issue is solved. Pros: Is able to run pretty much any game maxed out. Only a few that it cannot. And for those I think its my CPU that is holding it back. Has been running strong for over a year now. Runs pretty cool even under load, usually around 60 to 70C. Though since I ungraded my ventilation it gets roughly 10C less. If your not ready for a 600 series yet then this a great buy. Cons: Nvidia Drivers, But you can't blame the card for that I suppose. Pros: This thing runs everything I throw at it with no problems. It has huge amounts of VRAM that allows it handle most heavy use easily. No overheating issues and great reliability. I have never had a single complaint with it and it even survived a motherboard exploding! Cons: Its discontinued, if it wasn't I would buy another and feel confident in my graphics capabilities for years to come. Other Thoughts: It is a real shame that this is discontinued. Its a great card where your only concern will be in its length. If you cant take out your front hd cage or you dont have a full tower its gonna be tight. This was, however, reason for me to get a great full fractal tower...so, win. Bring it back EVGA. please?